At first blush there are few implications from the sale of Hebei Airlines, a domestic-only airline with a dozen-odd narrowbody aircraft, to Xiamen Airlines. But the transaction in many ways is a reversal of one of China’s main aviation trends: a proliferation of start-up carriers. There is a flurry of airline launches as eager and aspirational local governments recognise the value aviation can bring to an economy, plus the prestige. But the start-ups face a difficult entry environment. Their small size starves them of scale, and the existing shortage of management talent is exacerbated by new start-ups. Hebei Airlines was backed by its local provincial government, but the support waned as the government learned it could get a far greater return by supporting a local base of LCC Spring Airlines rather than attempt to have its own airline. Hebei Airlines now moves under the wing of Xiamen Airlines, a large and respected carrier. This could presage similar fates for today’s start-ups as they feel they need a closer relationship with a larger airline. Even the saccharine Chinese media could not hold back criticism of Hebei Airlines, which they termed a “hot potato”. It has a short but colourful and transient history dating back to its origins in 2006 as Northeast Airlines based in Shenyang. It was a subsidiary of Shenyang Aircraft Corporation, itself a subsidiary of heavyweight Chinese airframer AVIC. After difficulties in that market, the base was moved in 2009 to Guilin in China’s south. Barely a half-year later, Sichuan Airlines – from China’s west – announced it would increase its stake from 33.5% to 97%. The carrier would be re-branded as Hebei Airlines and move back to China’s north with a base in Shijiazhuang, the capital of Hebei province. Hebei was projected to have a fleet of 20 aircraft by 2015 and be profitable. 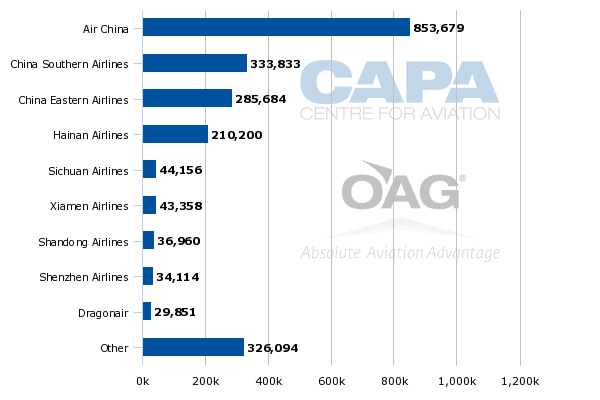 Instead Hebei lost approximately CNY1 billion (USD160 million) between 2011 and 2013, and in Nov-2014 has 11 aircraft, according to CAPA’s fleet database. China Southern says the audited results of Hebei Airlines show a negative 38% operating margin in 2012, and a negative 18% operating margin in 2013. A shareholder re-structure resulted in Sichuan Airlines reducing its stake as Hebei province, via locally owned Jizhong Energy Group (a coal company owned by the province), bought into Hebei Airlines. Now enters Xiamen Airlines from China’s southeast - but seeking a larger role across China. (Sichuan Airlines had a similar objective when it purchased Hebei.) Xiamen takes a 99.23% stake of Hebei via a typically convoluted shareholding process. Xiamen’s purchase is valued at CNY749 million (USD122 million). Xiamen is owned 51% by China Southern and 15% by Jizhong Energy, the company selling Hebei Airlines. China Southern says Xiamen will inject CNY800 (USDUSD131) million into Hebei over three years and provide a loan guarantee of up to CNY1 billion (USD160 million). Hebei Airlines in Nov-2014 has about a 21% share of seat capacity at its home market of Shijiazhuang. This is less than the 29% captured by China's leading LCC Spring Airlines, and is that is no coincidence. Spring in Jul-2009 established a base at Shijiazhuang. The Hebei government and Shijiazhuang were initially cautious about Spring but then saw Spring could deliver greater benefits on more modest subsidies than were being given to Hebei Airlines. There were also questions about whether Hebei could be managed with its major shareholder lacking an aviation background (since it was a coal company, and a state-owned one at that). The relationship was termed “ground-sky” to provide a playful comparison, but ultimately the contrast may have been too large. China’s regulator the CAAC is encouraging start-ups to partner with existing airlines. The start-ups are doing lining up, but the partnerships can be limited, focusing on one aspect - of training, for example. In addition, since the relationships become contrived. Without an equity stake, the incentive to partner effectively is small. Even when Sichuan Airlines was involved with Hebei, it only held a small stake. Replicating a management team for a small airline that is not piggybacking on a larger one becomes inefficient. It is also impractical when there is a shortage of management. This is a recognised problem, even at the larger carriers. The rapidity of China's airline growth means that this will continue to be a problem for a considerable period. It takes a number of factors to achieve disastrous results like negative 18% and 38% operating margins, as in Hebei’s case. One factor probably working against Hebei was that Shijiazhuang is connected to Beijing by high speed rail, and also to other destinations. Shijiazhuang is one of the stops on the high-speed rail line between Guangzhou and Beijing. If Hebei did not perform its best, passengers could simply go elsewhere on high speed rail. While high speed rail may be a challenge, it is not a fatal flaw at Shijiazhuang. Indeed, Spring is working to turn high speed rail into an advantage by using rail to feed passengers to Shijiazhuang airport from outside the immediate area. High-speed rail brings a larger catchment area than what could be achieved with regular rail or other land transport. Shijiazhuang can even be an alternative to some parts of outer Beijing: Shijiazhuang is to Beijing’s southwest while Beijing’s main airport is to the northeast and without a high speed direct link from the city’s south or western areas. Further, Beijing Capital’s slots are congested, limiting opportunity for passenger growth. Spring Airlines and Shijiazhuang airport partnered for an air-rail service in which Spring’s Shijiazhuang passengers (individual travellers only; not groups or charters) receive a free ticket on the high speed rail line. The ticket can be used all the way to Beijing in the north, Zhengzhou in the city or cities in between. The service was introduced in Jan-2013. Statistics are limited, but some published figures are that over 150,000 passengers used the service in all of 2013 and that over 20,000 passengers used the service in Mar-2014 alone. The cheapest tickets on the train are CNY75-111 (USD12-18) one-way for the one to two hour trip. Unlike at Shanghai Hongqiao, or a number of European cities, Shijiazhuang’s high-speed rail link is not directly at the airport but rather about 4km away (at Zhengding station) with a shuttle service provided. However, this is a better connection than at many Chinese cities where the rail station and airport station are further away with no dedicated connection service. There are 14 daily trains from Zhengding station to Beijing (about once an hour during the day) but the airport and Spring Airlines hope to increase service. Xiamen Airlines has been growing outside its home market of Xiamen and Fujian province. It has set up branches in Hangzhou, Tianjin, Nanchang, Beijing and Hunan, but the acquisition of Hebei could help Xiamen develop its northern China (and Beijing) presence significantly beyond what it can achieve with a branch in Beijing. Xiamen Airlines is the sixth-largest carrier at Beijing Capital based on seats, but this amounts only to about a 2% share. Hebei has previously mooted establishing a base at the new Beijing airport at Daixing, which will border Hebei province and is expected to open later this decade. The potential benefit comes with added complexity at Xiamen Airlines, which calls itself the world’s most consistently profitable carrier. This is difficult to verify, but there is no doubt Xiamen is one of the better run airlines in China’s difficult market. Xiamen is complicating its business as it moves away from its own narrowbody, mostly domestic, operation to needing to incorporate Hebei as well as Xiamen’s 787s, which are few in number but bring large costs – and potentially losses as Xiamen explores long-haul markets for the first time. Establishment of an airline and its survival are two very different matters. Many in China are celebrating the launch of recent airlines while others are working to start. Hebei strikes a note of warning, albeit one that people may prefer to ignore. But its lessons are that small, unassociated airlines may struggle to survive. Hebei faced difficulties, even without much interference from China’s big airline groups. Others may not be so fortunate. Many of China’s new airlines would benefit from closer ties to existing airlines or even as part of a group, a base rather than a separate carrier. Spring’s Shijiazhuang base shows that an airline from outside the region can prosper, given the right strategy and scale. Spring may not carry Hebei or Shijiazhuang’s name, as the provincial government aspired but Spring has offered a more sustainable and effective alternative. If Hebei Airlines does establish itself at the new Beijing Daixing airport, it will be interesting to see if the Shijiazhuang base continues actively or is gradually wound down. The Hebei Airlines case study thus highlights two issues for China's regulators to take on board. First, as new, often government supported, airlines emerge so the danger grows that unprofitable and unsustainable models will persist in the market, regardless of losses. Subsidised double digit negative operating margins, limited assets and a minor brand are not attractive propositions in a commercial marketplace. 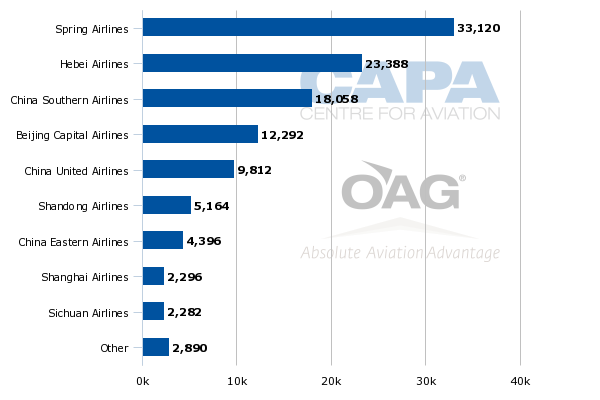 Secondly, an expansive airline strategy emphasises the need for experienced management resources. These skills are rare in many fast growing markets, but in China, where typically airlines have been built around substantial government and political involvement - often to the detriment of good governance and management - the issue is acute.